my first posting here although I have been dipping in & out looking at the cool projects that are going on. 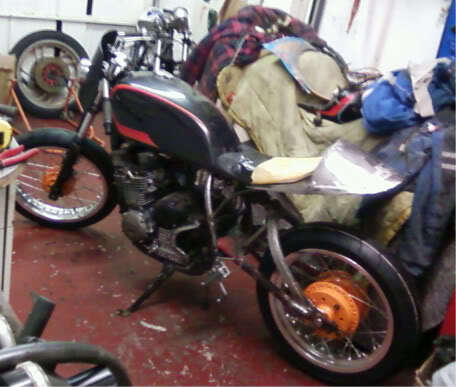 Well I have my own project at the momentin the shape of a Yamaha XJ550 hailing from 1981. 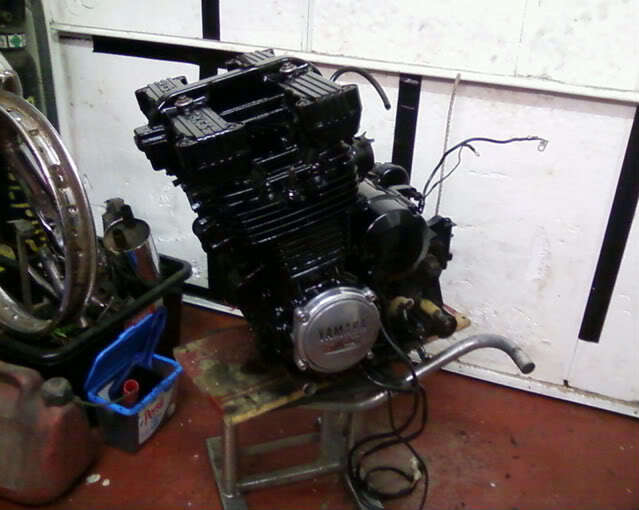 Bought as a rolling chassis with everything else in boxes althought the engine was/is in one piece. 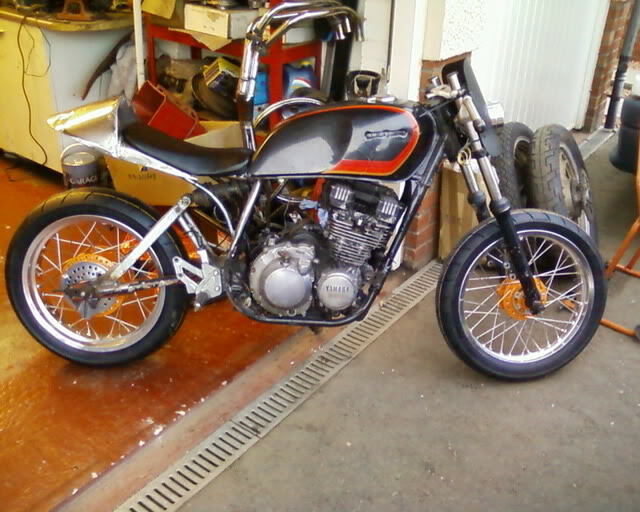 Previous projects have included a RD350 aircooled race bike that I raced at East Fortune for 3 years & a Suzuki T20 race bike that i won the SCRMC 250 championship on so they I would think they qualify as cafe racers aswell. Initial thoughts on the XJ were to lose the heavy cast wheels for some wire wheels, BIG brake on the front & possibly a monoshock rear end with a single seat unit & lose as much weight as possible form the chassis. So far I have managed a few of these aims & here are some photos of it so far. 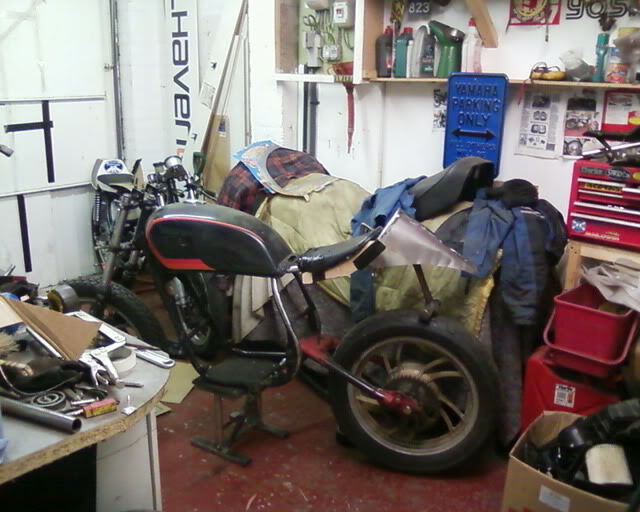 then a FZR400 seat & a home made tail unit from sheet metal. Once welded up & with the tail unit trimmed to a more pleasing style. 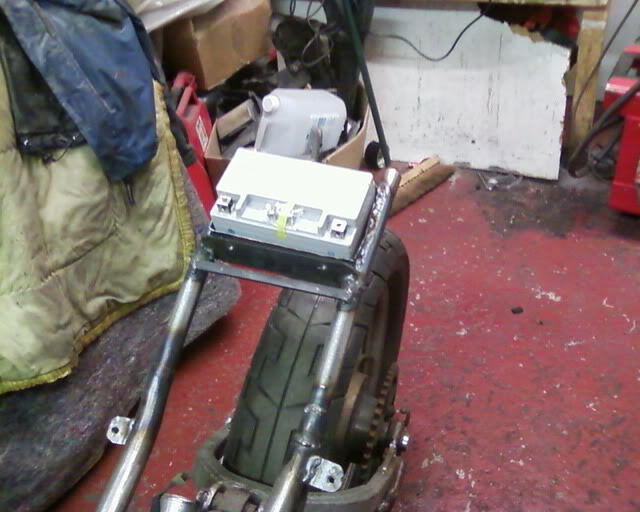 Mounted the battery under the tail unit whilst I waited on the stainless spokes coming for the hubs. 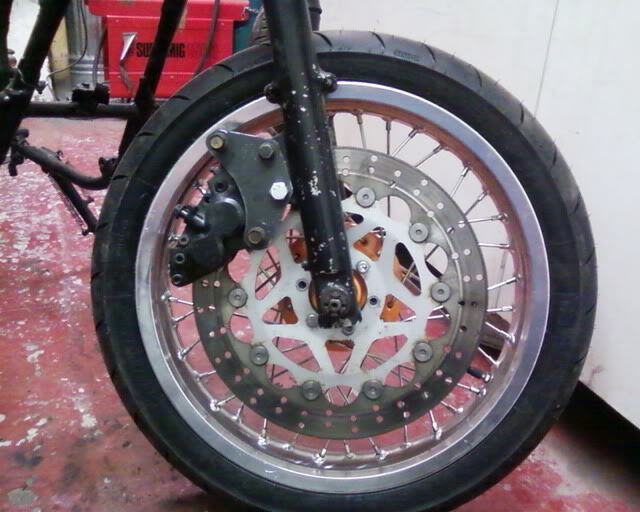 Once the spokes arrived I built the two wheels with 17" rims, 2.5x17 for the front & 3.00x17 for the rear.. & trial fitted the Aprilia 320mm front disc to the front wheel. 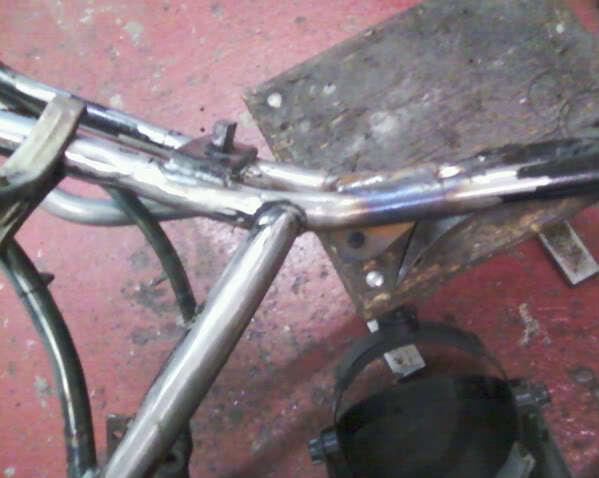 Been messing about with the HEAVY Motad exhaust today & it has lost a considerable amount of weight with the help of my grinder Welding it all back up tomorrow. Hi Col and welcome, it's nice to see real home-grown projects on here, and it's also nice to see traffic on here picking up, who knows, this might become a busy forum yet! Like the looks of your Yam, that's some radical and savage slimming programme you've got going, really like your home grown seat unit. If you raced at East Fortune does that mean you're based North o' the border? thank you & yes you are correct I am North of the border or is it that everyone else is just South of the border?? Based in East Lothian so only a stones throw away from East Fortune which makes things easier for racing. The XJ had to really go on diet even though only being a 550 it is a wee heffer like as standard & an easy way to make it faster is to make it lighter.. .
Had some tyres arrive today for it of a sticky compound too so once the wheels are trued, probably tomorrow I will be fitting them to have it rolling around on the proper wheels. I'll keep you all updated as would like to see this site take of. 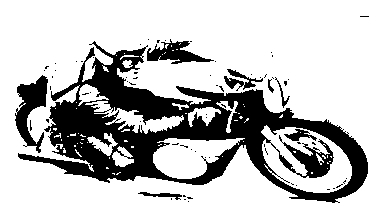 In which case I may even have seen you race, don't get along so often now seeing as how I was bike-less for 2 years (well, a Yam XV750 which I ifnished up triking so that doesn't count!) 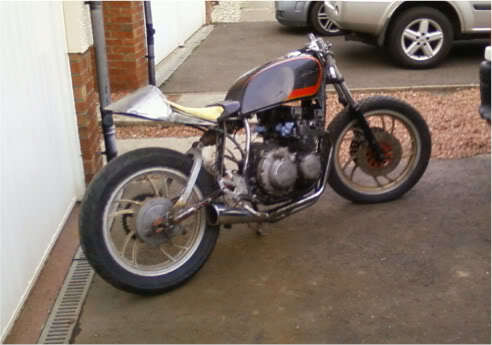 until I picked up my CB750, but progress has been slow due to work commitments and an un-heated garage! Good luck with the build, it seems to be coming on at a cracking pace. You may well have seen me race Paulie, I wasn't out last year as I lost interest in racing but did spectate or help out witha mate when I went. Unheated garage??? Put to jerseys on man!!! Removed the original silencer & the internal baffling that is also in the meg part of the exhaust. Welded up the spot welds I had to drill out & welded it back together & now with a removal end cap re-using the original Motad part. 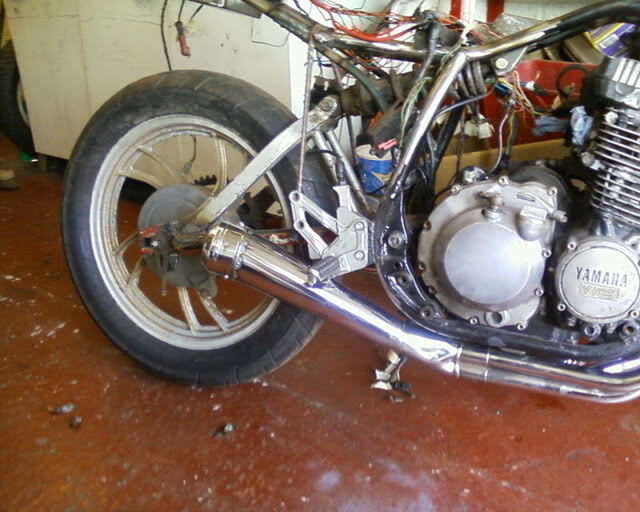 For silencing I bought some stainless 45mm perforated tubing & with exhaust wadding that should maybe keep the noise down..
You will see in the second photo my wiring loom hanging down at parts. I've removed all the tape so I can hopefully trim the loom down to the neccessary wires as I dont want to run with indicators or the side stand cut of switch or any other bits that don't help it run any better than needed. Not my strong point wiring but hopefully I'll get there with it..
Never bothered with the wiring tonight as I got my tyres yesterday & trued up the wheels tonight. 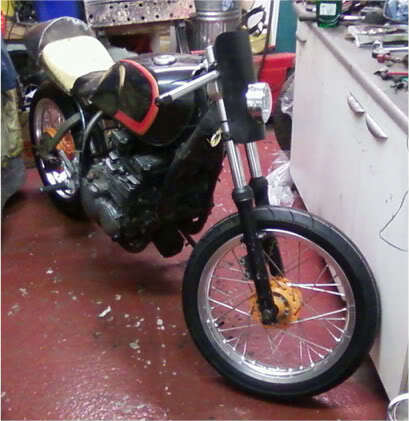 Then trial fitted both wheels to the bike. Unfortunately it was a bit late before I finished with it & could only get a few photos of the bike in my tight garage, dark outside. Here it is sitting a bit more level & lower with the 17"s on it instead of the 18+19's it came with originally. You can see it with the position of the headlight now aswell. I won't be keeping the black plate on it either. Have an alloy one for it on it's way. 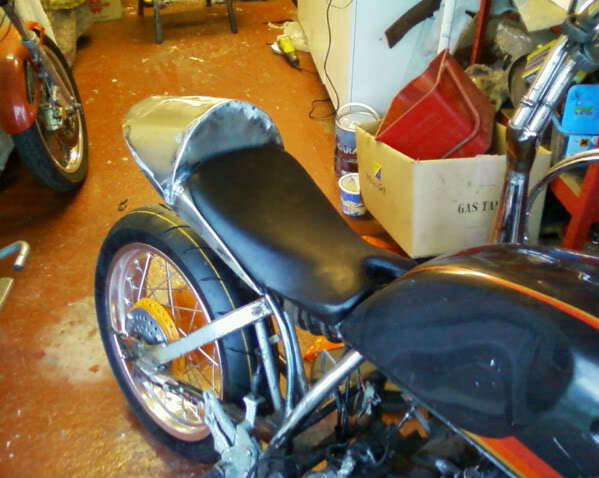 Anyway I did a wee bit tonight, I recovered the seat & started filling the seat unit itself to have it nearer to paint. I also pushed the bike outside for a better piccie of it with it's shiny new wheels & tyres. i think the other projects may have gone quiet as the weather has just turned nice and prob enjoying riding in it rather than tinkering in the shed in it. well i hope so anyway, i fancied starting my own project post but progress is so slow tht it wouldn't be a thrilling read like your and would probably be more seen as spam than post lol. anyway keeo it up. 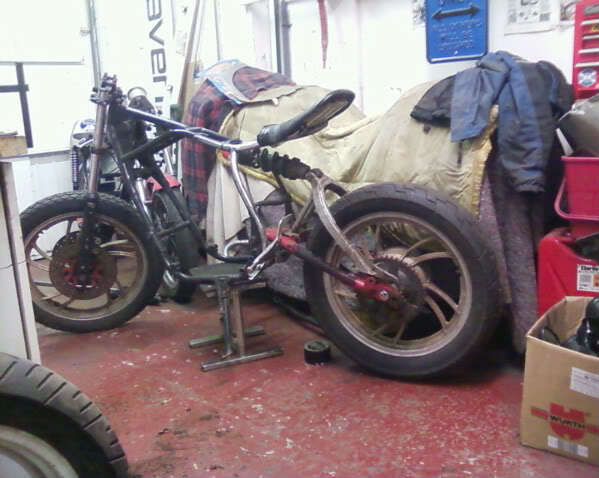 im planning on chopping a bit off my z400 frame but am trying to find out if its a big job and legal as a road bike after. thank you. 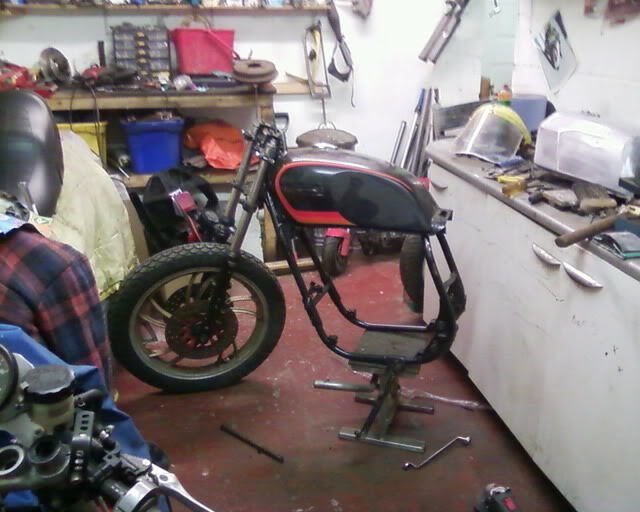 The bike is slowly getting there but will be a wee whilst yet before it is on the road. .Most of the hard stuff is done now I hope.. It will be the finishing details that will take the time I think ..
You could be right with folk getting out on their bikes right enough instead of being in the shed.. Usually the opposite with me, never seem to get the time to ride them..
Get a post started on your bike, I'm sure others including myself are keen to see another bike being built no matter how quick or slow the progress is. .
A bit done today on the XJ with cleaning up the swingarm where I've been welding tabs on for paddock stands & shark fin & the welding from mating the XT swingarm top to the XJ bottom half. Removed all the paint & once I have tapped a few holes into it I will be ready for paint. I wasn't happy with how low it was sitting after fitting the 17" wheels so I removed the top shock mount & rewelded it 10mm further back which is enough to give it a wee lift to where I am happy with. Welded a few spots on the lock stops too so fingers won't be trapped on the tank from the clip-ons. 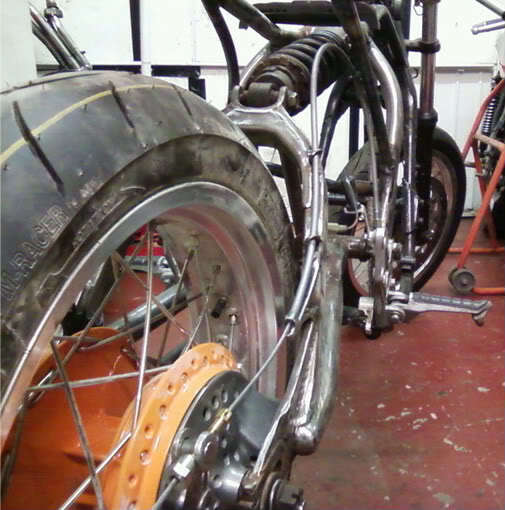 Finally mocked up the front brake caliper & disc. Will be needing a 15mm spacer made up for the disc to hub which I will get a mate to do as he has a lathe & I will cut out the caliper bracket from some 10mm ali I have lying around. 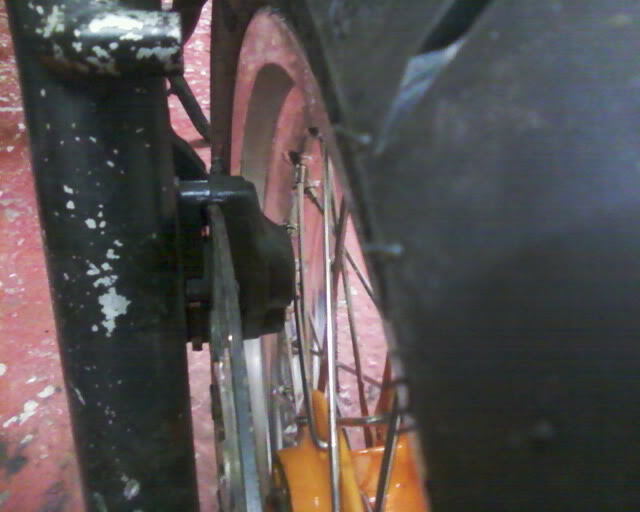 You can see from this piccie that I have plenty of clearance from the spokes to the EXUP caliper . 3mm easily..
Only the front is a bit disturbing, never seen something like that! 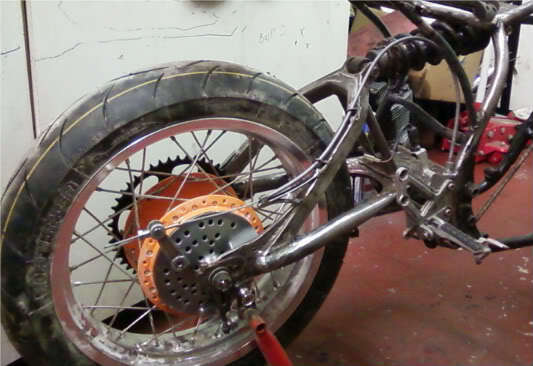 don't be disturbed by the front wheel & brake assembly. This is only a mock up of how it will look . I have some 10mm aluminium plate that I will use for the bracket for the caliper & all 6 bolts will be used to hold the disc before I use the bike. Hoping it will stop pretty well with that lot on it. 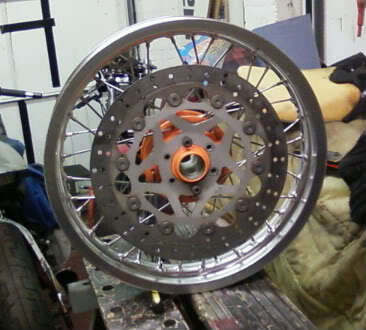 If not I'll make it a twin disc setup & that will surely do the trick.. Concentrating on getting the back brake to work now. 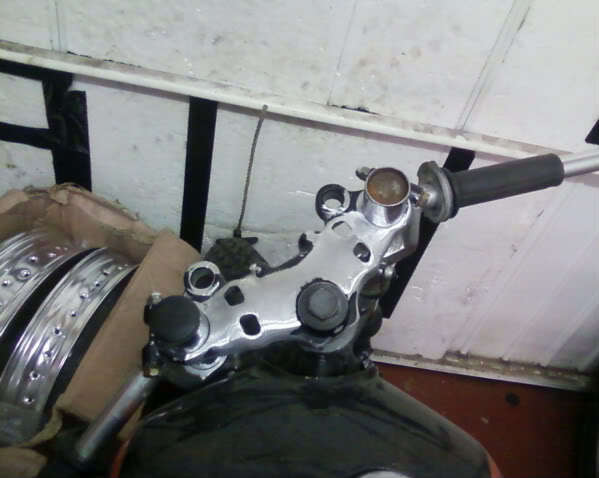 Going for a cable operated drum as I can't use the existing rod from the brake pedal as with me modifying the swingarm there is no route for it to the brake lever on the hub.. Photos of this once I have it sussed out. 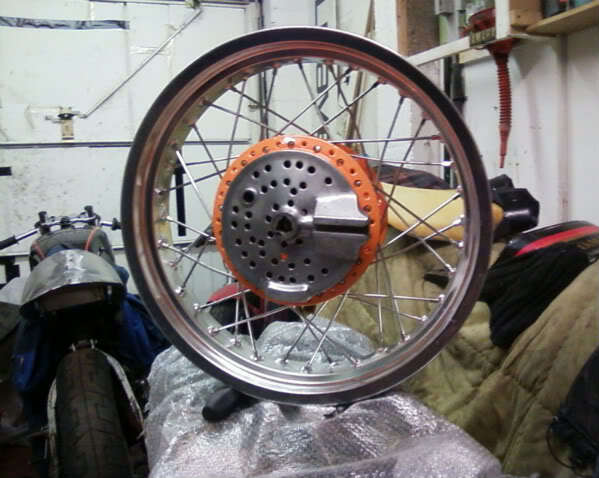 More or less finished the rear brake tonight. Replacing the rod operated brake with a cable due to the rod not being able to be used with the XT top half swing arm on the XJ. The bends needed in the rod to clear the arm would have looked all wrong. I came up with a similar thing that I used on my T20 race bike. A Vespa rear brake cable & assorted adjusters & cable stops.. The cable routing is kept in place with wound 4 mm rod that I coiled around a 10mm bolt & cut 3 colis of then welded to the swingarm. 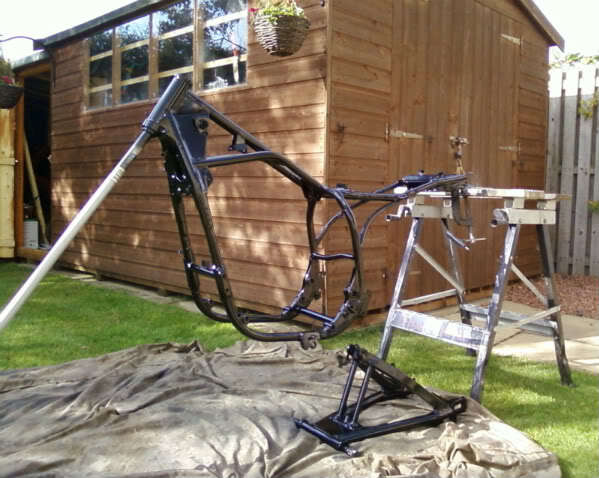 That's the swing arm finished bar painting so I will remove that now & finish of the welding on the frame. Still need to have the brake pedal welded up to accept the Vespa cable eye. Not much done to the XJ in the past two weeks unfortunately with being busy at work then having a wee hoilday with the family but back at it tonight. Dressed up most of the previous welds on the frame & welded in some frame bracing & put in a bracket for a steering damper. Forgot to take a photo of the steering damper bracket.. D oh!!! 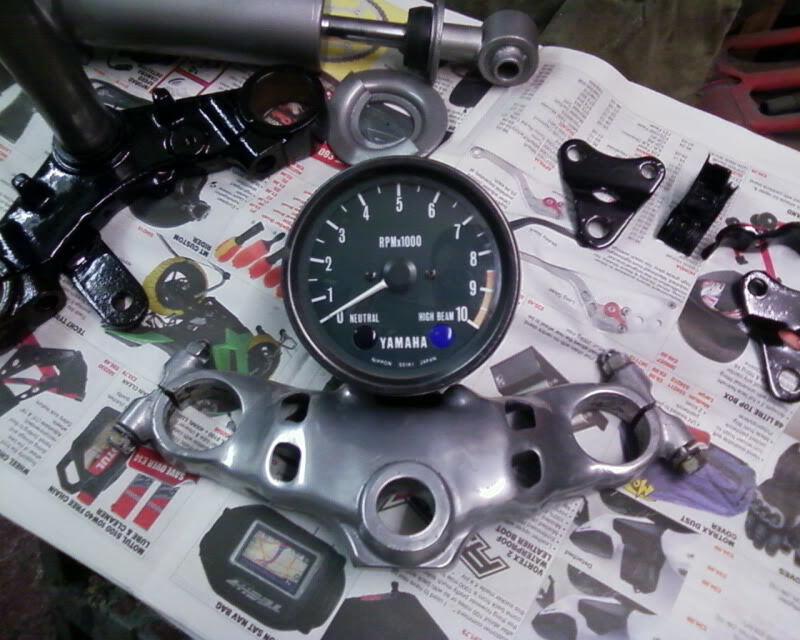 I'll get that tomorrow along with the modified lower lower yoke. Paint removed from frame now with wire brush attachement to grinder. 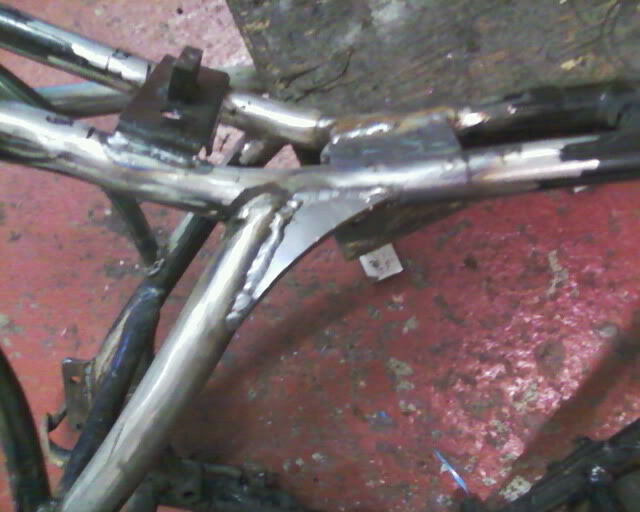 A new frame brace welded in to replace the split lower rear one where the centre stand used to live. 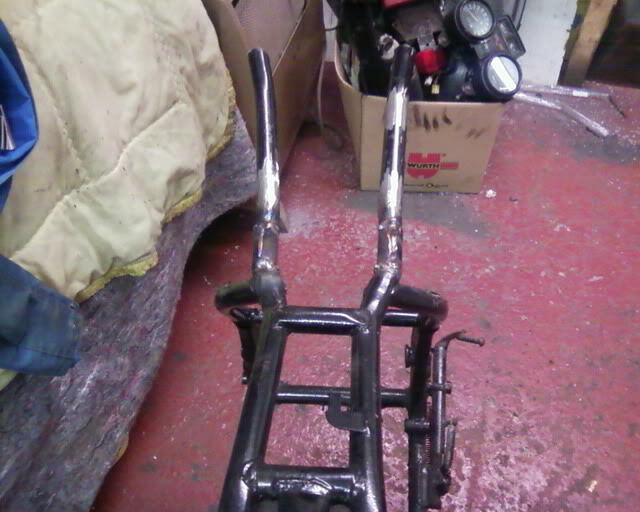 Paint removed from the fork lowers, the top yoke & the front brake caliper which was actually anodised black underneath?????? Why it was painted(badly) I don't know??? 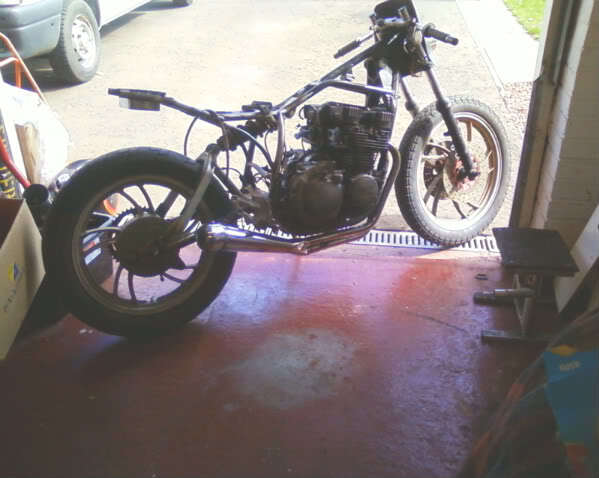 It will be polishing of the fork lowers & top yoke once again tomorrow I think & prepping the frame & swing arm for primer & if I get a chance possibly degrease the engine too..
Been dodging in between paint stripping & painting today. 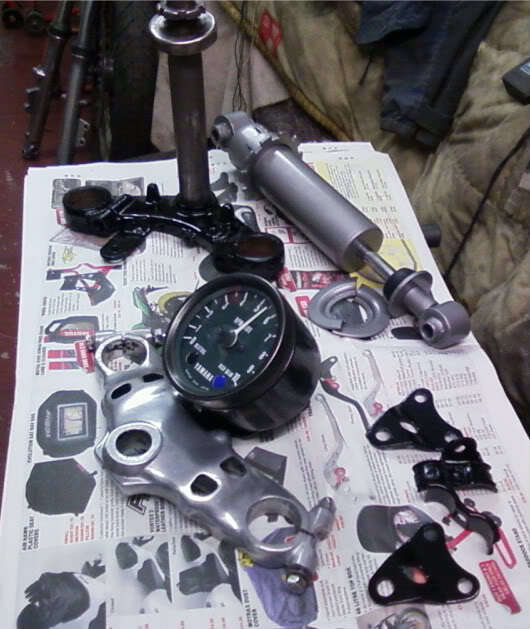 Paint stripping the petrol tank & the painting of the rear shock, engine & tacho mounts. Here's the tank with a coat of stripper on it.. Turned out like it has had a wee bash & has been repainted properly with the correct decals fitted at one time in it's life. A wee bit of filler was on the left hand side where your knee would be.. Ground of the plates for the tank badges as I want a smooth finish to the tank there. First coat of filler is already in there now too. Be rubbing down tomorrow... the joys.. Thought I'd put up some photos of the bitties I've been giving a lick of paint these past few days. The major part was the engine. I would've really liked to have stripped the motor completey for this but I'm hoping to eventually put in a tuned 600 at some point in the future so this one has had a wee clean up & some engine enamel for now. 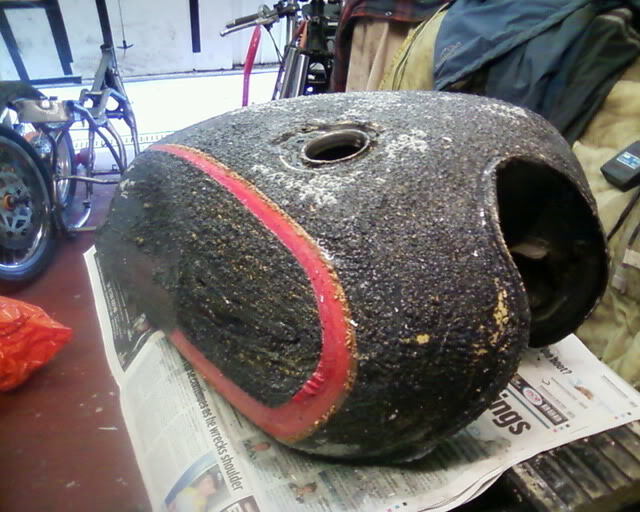 Still to polish the casings & expose the fin edges. 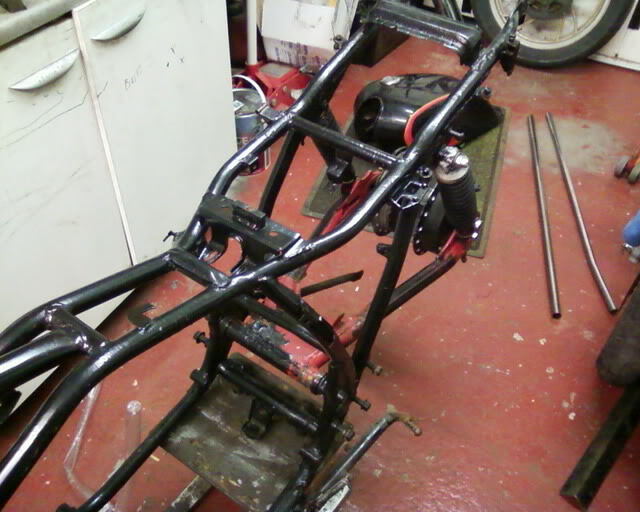 May well have the frame done this weekend if not Monday, see how it goes. regarding your tank if the nitromors isn't looking at it I would scrape the nitromors of it give it a good rub down with some 80/100 wet/dry & maybe a rub with some cellulose thinners to remove the grime & crap that may be lying on the surface then try the nitromors again. 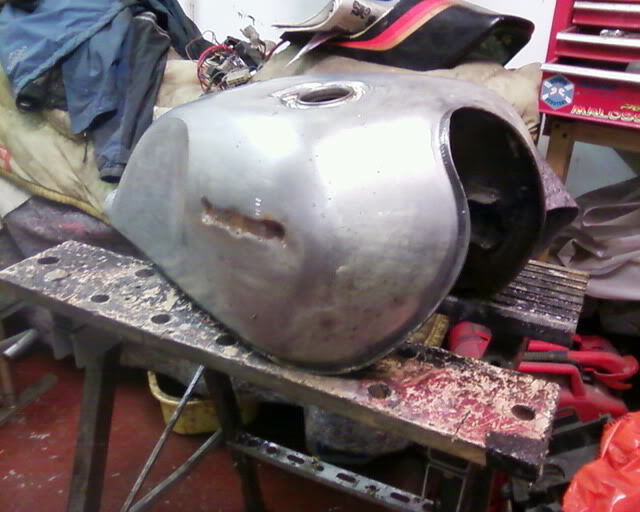 Could be that the tank has wax or polish build up on it & the nitromors doesn't touch it as I've found in the past. You will get there in the end.. keep at it. 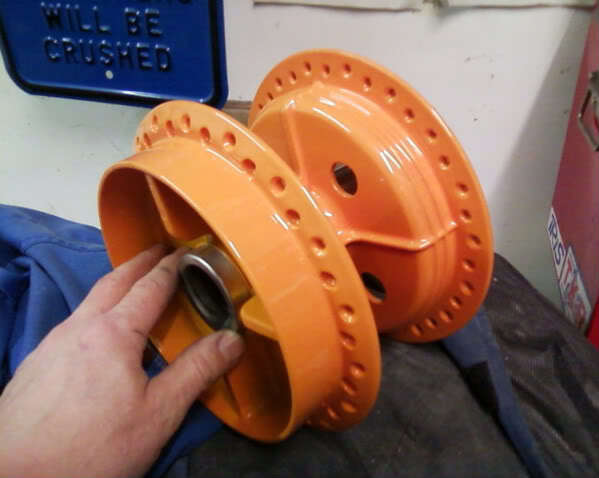 Been a bit busier today with a mate turning down the spacer I needed for the front disc. Thanks Gordon. One more bit done making it all closer to completion. Once that was done I was back to painting the frame which I decided to paint in the back garden seeing it was a nice sunny warm day. Used Simoniz Tough Black enamel which I'm well impressed with giving a really shiny flowing finish in deep black gloss. Hoping to have it as a rolling chassis for the weekend with the engine in place so I can move it around as I will be receiving a Suzuki T20 race bike for the weekend 11/12 June to race at the Bob Macintyre trophy meeting at East Fortune. The T20 needs a bit of space so the XJ has to be rolling to give me enough room in my garage. Looking good Col, it's coming together nicely. I have to agree the 550 is looking good. 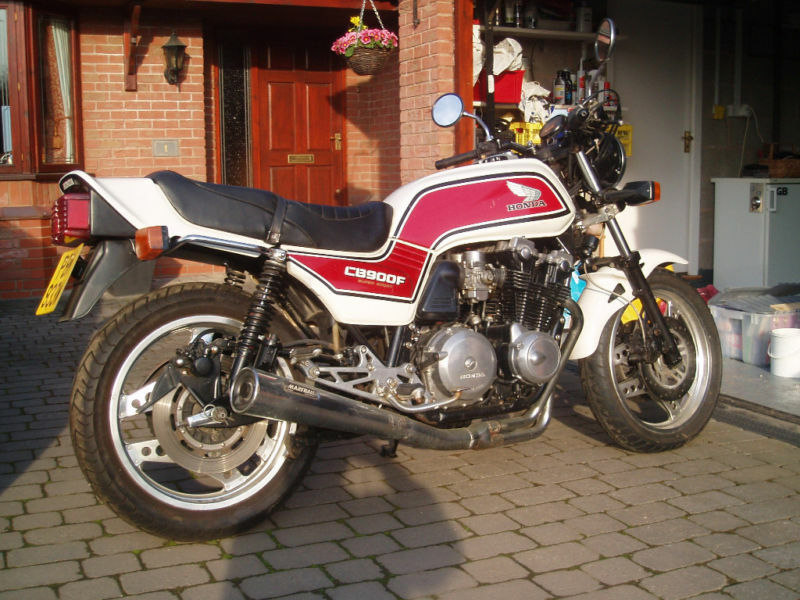 Quick question - as I am going to spray my CB900 frame with Simoniz as well. So did you spray onto bare metal? Did you take the complete frame back to bare metal? Does the Simoniz spray a thick layer which will hide a previous poor paint surface? 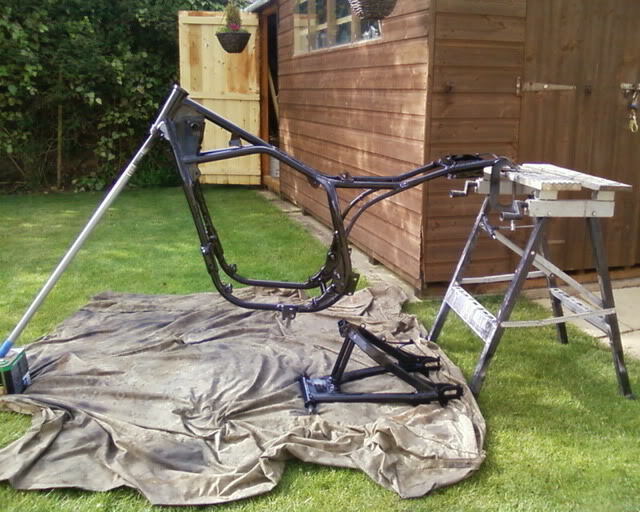 I stripped the frame & swing arm of all the old paint & oil etc with a wire brush attachment to my grinder, then primed it with the Simoniz acrylic primer before painting with the gloss black. Depending on how bad the surface is will depend on the finish I would say. Definately priming it will help & a wee rub down between coats of the pimer & gloss would go a long way to give a smooth finish but overall I found it pretty good. As good a finish as PJ1 that I have previously used & cheaper which is always a bonus . 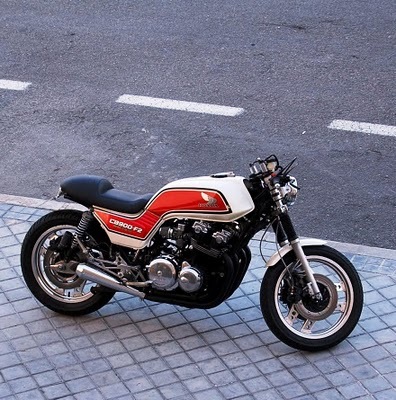 CB900?? Nice.. Wheres the photos?? Thanks for that help. I just wasn't sure about the primer. That is going to look is the business, well smart. Nice one.